The last day on board started early. As every morning we had a wake up call 15 minutes before breakfast began, than one hour for breakfast and then the trip. Today’s wake up call was at 5.45 a.m…. We started with the collosi of Memnon which were not that colossal at all and had many people trying to sell touristy rubbish in a very aggressive way. 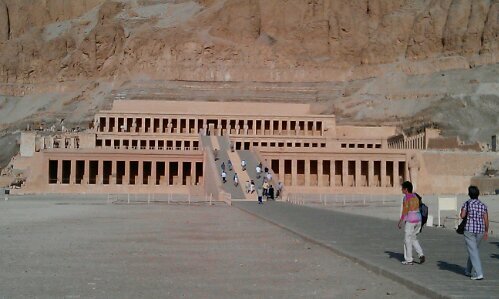 Far better was the second stop, the temple of Hatchepsut, a pharao queen. Having been build supporting the rocky mountain behind it was very beautiful to look at even though I really couldn’t follow our guides explanations anymore (we were sorted in groups of 30 on the first day and went on all trips with this group and our allocated guide). 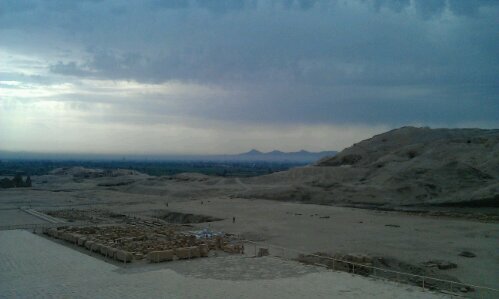 Later we went to the famous Valley of kings (were you aren’t aloud to take pictures which is why I can’t show you any). Having been to a really great Tut Anch Amun exhibition last year in Cologne we skipped this grave as you also had to pay more than 10€ extra for that and visited the three graves you are allowed to see. 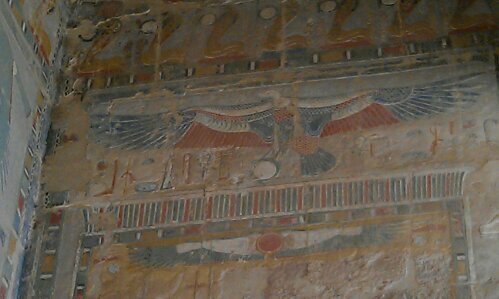 We saw the graves of Ramses the 3rd and the 9th and Seti the 2nd which were all quite interesting. The valley itself is not much to see: a stony valley with different size but others than that looking all the same simple entrance holes in the mountains. But the graves with its long tunnels and burial chambers and beautiful and colourful paintings and carving are not for the claustrophobic and hot inside. Unfortunately I didn’t have my guide book with me so we didn’t know much about what we were seeing as guides are not allowed to linger and lecture inside the graves. After this last part, the trip was over and our Nile tour nearly too. And because I promised to finish the last posts I did tonight. But now it’s time for sleep now as the wake up call is in 5 hours before we then drive to Marsa Alan and spent week 2 in a hotel. This entry was posted in Egypt and tagged Luxor, Nile cruise, Ruins, Temple by kathatravelling. Bookmark the permalink.